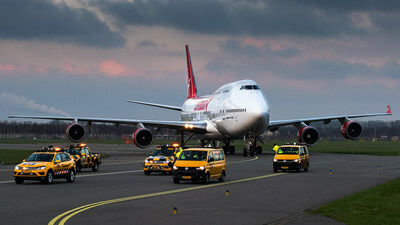 Travel agency, airline company and hotelier Corendon will have a complete Boeing 747-400 transported from Schiphol airport to the Corendon Village Hotel in Amsterdam this February. There the plane will be placed in the hotel garden. For this mega job Dutch specialized transport company Mammoet has been brought in. Mammoet will transport the 150 ton plane in five days from the airport to the hotel, starting Tuesday evening February 5th. During its spectacular last journey, the Boeing has to cross 17 ditches, highway A9 and one provincial road. Corendon invites media and journalists to closely follow and visit the transport from the Control Room and the Skybar of the hotel. This will take place from Tuesday 5 to Sunday 10 February. To be present during this spectacular event, please register via this link before Friday 1 February and indicate preferred night(s): https://corendon.typeform.com/to/k00nma. The aircraft will cross the Schipholweg during the night of Saturday 9th to Sunday February 10th and will make 57 traffic movements before it takes its place in the garden of the Corendon Village Hotel. On Monday February 11th Corendon will send a press release with all information and images about the transport. Corendon is a leading tour operator, airline company and hotel chain on the Dutch and Belgian travel market. In 2018 Corendon gladly took care of the holiday for over 750.000 holidaymakers to dozens of sunny destinations in and outside Europe. Corendon's aviation business includes Corendon Dutch Airlines, Corendon Airlines Europe and Corendon International Airlines with a total fleet of eighteen aircraft. Corendon Hotels & Resorts offers ten hotels and resorts in the Netherlands and Turkey and on Ibiza and Curaçao. Corendon has a strong market position due to its sharp prices, its no-nonsense approach and its extensive experience in the travel industry.